British luxury yacht builder Hunton Yachts is setting a new standard in ultra-performance cruising yachts with the introduction of two new models; the H45, an extended and reimagined version of the H43, and the completely new game changing 16.7 metre H55. Both models see the British brand lean on its power-boat racing heritage to create the best performance cruising yachts of its generation. She drew links between Hunton Yachts and the high end of the luxury automotive industry. “When you build a Bentley or a Rolls Royce you know that every inch of it is perfection – and it’s exactly the same with Hunton,” she says. Pool points to the builder’s newest and largest cruising model, the H55, highlighting its “advanced hull geometry.” The H55's deep V hull has a dead rise of 21 degrees, allowing it to “cut through every wave and chop”. “The rise allows it to cut across the top of the water, which creates little drag and means you’re not pounding against the waves,” she explains. This is combined with “an extremely low centre of gravity” which gives the H55 unrivalled stability, setting Hunton apart from other builders. 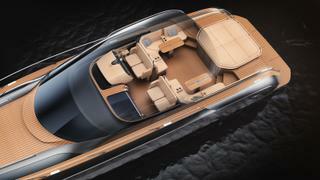 The H55 combines cutting-edge hull design with Hunton’s racing DNA. 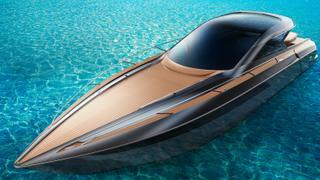 The result is an eye watering top speed of 55 knots and a range of “superyacht features”, Pool claims. These include fly-by wire digital joystick and touchscreen controls. The H45 meanwhile is an evolution of Hunton’s smaller H43 model. Pool explained how extending the H43 by “just a few feet” created 30% more volume. This allowed the yard to reconfigure the cockpit and create a “proper aft cabin”, increasing maximum sleeping capacity to four guests. Both models are available with a number of customisable options spanning fabrics, colours and furnishings, ensuring no two models are ever the same. “If an owner wants the colour scheme to match their Aston Martin, of course we can do that,” Pool says. Both models are aimed at a client who favours exclusivity and uniqueness, Pool says, and promised that Hunton can certainly deliver in this regard. While Hunton is keen to emphasis the universal appeal of both models, Pool believes the Asian and North American markets are ripe territory, especially for the H55. The US has also become a key focus for the company as it prepares to complete construction on the first H55 by the end of this year. For more information, visit Hunton Yachts.